Enjoy fishing, boating, snowmobiling, ATVing and much more at this cozy retreat located on Butternut Lake, which is a Class "A" muskie lake and is also known for its walleye. This cabin includes a dock, fire pit and nearby boat landing. The kitchen is well equipped with an electric range, full-size microwave, full-size refrigerator, dishwasher, serving sets for up to 10 people and much more. The living room consists of a fireplace, a television with Direct Satellite System, DVD, VCR, and furniture to allow for a comfortable stay. The spacious deck is perfect for family gatherings. 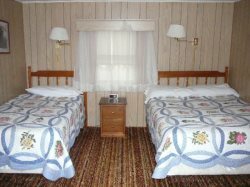 Come enjoy a beautiful stay at this cozy and comfortable "home away from home"!